Who doesn’t love the Manatee? This marine mammal gets the nick name “gentle giant” because they are slow moving, big (weighing in over 800 lbs), and they are friendly with humans. Just looking at photos of them you instantly want to meet them. If you live near the intracoastal waterway you might see them often, they like to hang out under boat docks and by sea walls. They are attracted to the warmer water and the food they can get here during the winter. During other months they spend their time in ocean, especially the Gulf. Manatees have been sighted as far west as Texas and as far north as Massachusetts, that’s quite a range. However, the majority of the manatee population lives up in the Crystal River area on the northwest side of Florida during the winter months. Crystal River is a special place for the manatee because it supplies them with food, freshwater, and protection. Crystal River is also special because it is the only place where it is legal to interact with a manatee in the water. FWC sets laws about swimming with manatees, making it a great experience for both human and manatee. To learn more about swimming with manatees, join us for our Force-E Manatee Trip to Crystal River, Jan 20-22, 2017. Another area where you can meet a manatee is in Palm Beach County. It is not legal to purposely swim with manatees here but divers have had numerous encounters with manatees swimming by at the Famous Blue Heron Bridge. If you are lucky this could happen to you! The laws that protect the manatee state you can not harass, chase, or touch them…so if you get lucky to see one at this dive site just stay put and let the animal swim around or by you. Not sure you want to meet a manatee in the water, no problem FPL opened the Manatee Lagoon last year in Palm Beach County. 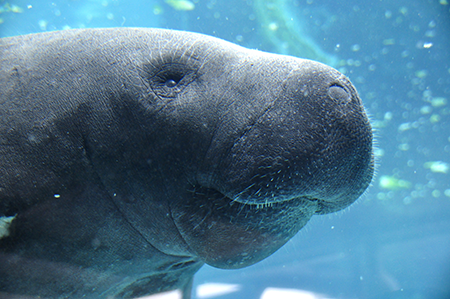 Manatee Lagoon is a discovery center with activities and tours to learn about the manatees and a viewing platform. You can also check to see if there are any manatees right now at the center with their live cam! Force-E is planning an event on Jan 14, 2017 to dive at the BHB and then meet up for a manatee tour/talk at the Manatee Lagoon, join us by signing up online to let us know you are attending. For more information about manatees and to learn about the Adopt-a-Manatee Program, please visit the Save the Manatee Club website.